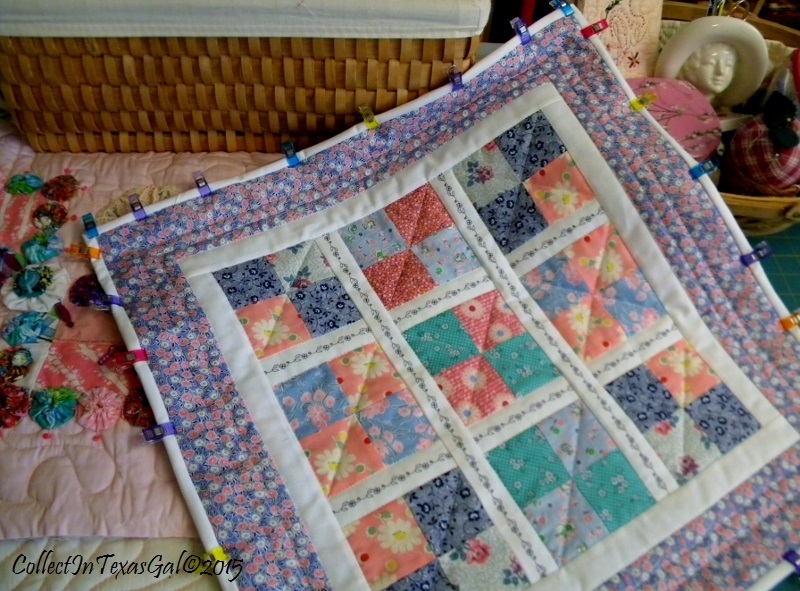 I do so love and appreciate hand quilting and hand embroidery, and I have done quite a lot of both in the years of being a needle and thread enthusiast. However, I have an affliction I call FastFinishItist that often results in hand done not getting done...sometimes for years! Lucky for me I have sewing machines that accommodate my pedal to the metal need for speed. Especially now, when I am dashing through my 'Stashes' getting ready for September First Saturday Booth. 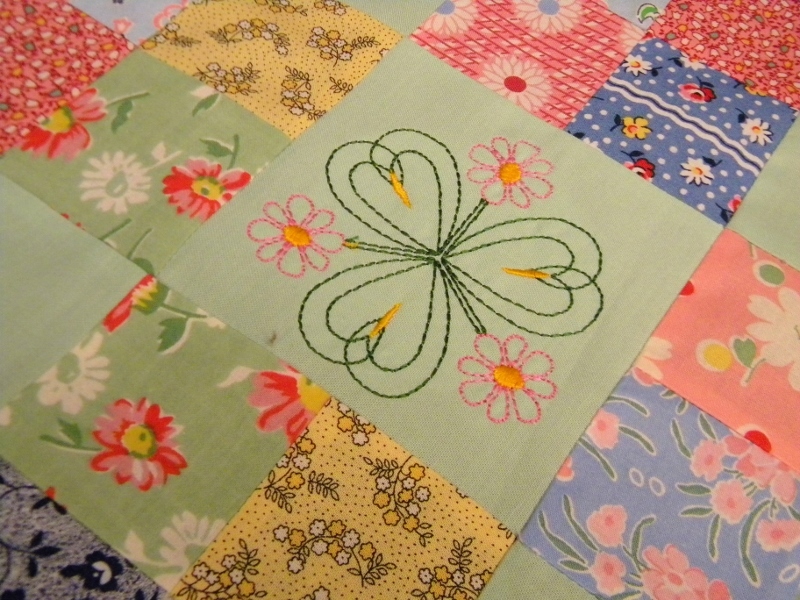 I am enjoying making 'Small Quilts'. For one thing, they are the perfect medication for FastFinishItist even if handwork is involved. Like stitching down the binding on this machine quilted Four Patch of 1930's reproduction fabrics. To give it a bit more 1930's look, I machine embroidered a floral vine in the sashing. *Cut-A-Way Stablizer...place on back of sashing strip (same size as strip to eliminate seam bulk. *Embroidery Thread...use a rayon embroidery thread. It has a pretty shine and stitches evenly. *Tension...reduce your TOP tension. I go from 5 to 4. This allows your bobbin to pull the embroidery thread to the back and eliminates the dot on top. 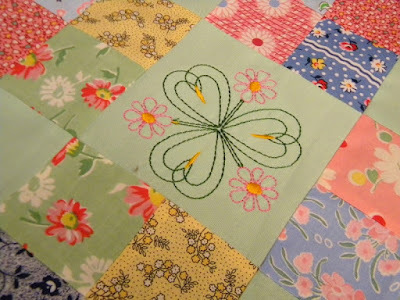 I'm getting ready to machine quilt this table topper which has four blocks machine embroidered in a hoop. Now this embroidery really is a FastFinishItis Fix. It has three color changes and well over 1000 stitches and takes about 10 minutes to stitch out. 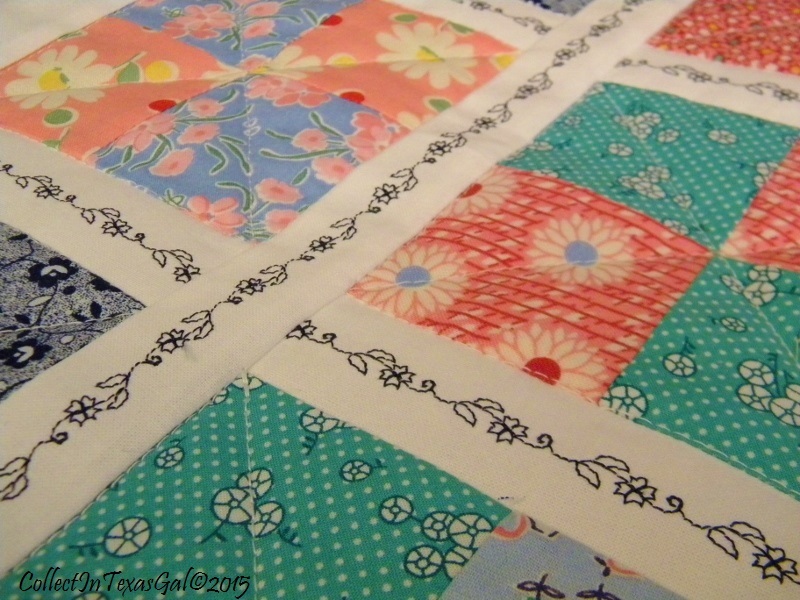 I'll be back with more of this small quilt tomorrow. Yep, I plan to have it finished by then. Hooray for 21st Century Sewing Technology! The embroidery makes them extra-cute. I've not seen anyone do that before. 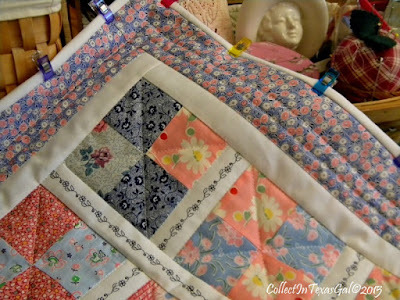 Those are wonderful, I just love the small quilts!! Yes, I understand so the need for speed! I'm sitting here chuckling! Enjoy your weekend with the pedal to the metal!